Aristida purpurascens.© J. K. Marlow.www.namethatplant.net (Accessed 5/2014). 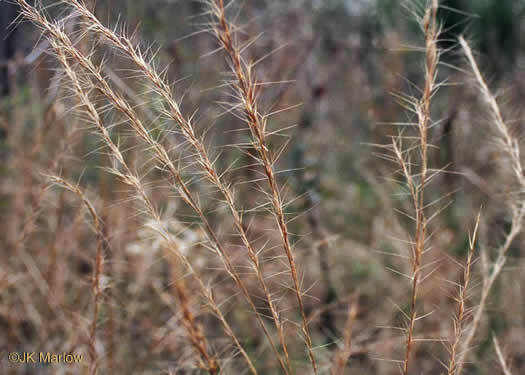 Aristida pupurascens is a C4 Perennial grass, 0.4-1 m tall, tufted from a knotty root crown. Leaves alternate, blades to 20 cm long, flat, 0.1-0.4 cm wide, lower sheaths softly hairy, covering nodes. Flower spikelets 1-flowered, first glume 0.8-1.4 cm, second 0.7-1.0 cm, longer than lemma, lemma 0.6-0.9 cm, 3-awned, central awn 2-3.5 cm, laterals 1.5-3 cm, divergent, not twisted; inflorescence 10-20 cm long, 1/3-1/2 length of plant, purplish, spike-like, branches short, appressed; blooming and fruiting Aug.-Oct.